Tailor Brands 2019 review - why 4.7 stars? Tailor Brands offers a full range of branding services – not just logos. From social media to presentations to branded letterheads, you have a lot to choose from. The basic and premium plans are affordable for everyone, and there’s also a free trial that allows you to use the logo builder so you can get a feel for their products. Instead of using fixed templates or crowdsourcing to create your logo and brand identity, the software uses machine learning to determine the desired style and needs of your emerging brand. In today’s highly competitive online market It is essential to have a solid corporate presence – in order to reach out to your target audience, you must have a consistent and quality brand. A modern company should have an attractive and functional website, with a clearly defined user journey. Having a notable web presence has become critical to sustaining your business, and a significant part of this is having a solid, memorable logo – a symbol that remains vivid in the minds of your clients. A high-quality logo is a key part of keeping people engaged with and attracted to your brand. Tailor Brands is an all-in-one branding solution, allowing you to build a quality and consistent brand, for use on your website and across all communication channels. At its heart is a platform where you can quickly design a quality logo to bring your brand to life. Building an impressive logo and establishing a solid corporate identity is made easy by their intuitive technology. Whether you are an individual or a business, making a logo from scratch, or trying to update an existing one, there is an offer for you with Tailor Brands. As the name suggests, it makes customized logos that are high quality and professional-looking. You can then build on this to include your new brand identity into all elements of your online presence, weaving a powerful and memorable image in the mind of potential customers. Rather than using fixed templates to create your logo and branding materials, Tailor Brands uses machine learning and an iterative and interactive process with the user to determine the desired style and needs. Among the information that is used to create your branding is your industry and description of your business, as well as whether you prefer icon, logo, or initial based design. You will also be presented with several sets of designs to choose from in order to fine-tune the final design. It is increasingly important to have engaging posts on social media to draw hits to your website, with a view to converting these to sales. The progress of your business is directly influenced by the way you interact with customers on social media. It is perhaps the most ideal space to grab more buyers and generate leads for your business. Tailor Brands is clearly aware of this, offering support in producing high-quality content, laid out in an eye-catching and appealing style. The “Social Posts” tool provides PNG files which you can include in your posts on a variety of social media platforms. These consist of highly stylized and visually appealing graphics designs combining pictures and text. These are especially useful as they allow you to blend in your brand colors, ensuring every post you put out serves its specific function while simultaneously promoting and reinforcing the brand. Making use of this opportunity, and getting social media posts designed in a professional style with Tailor Brands, is really easy. All you have to do is follow a straight-forward procedure, simply entering your text and you’re free to create as many graphics as you like. Another very useful feature of their social media tool is their Social Cover Banners tool – this allows you to create visually appealing headers for the top of pages on your social media platforms. Combining a picture of your choice, either from an existing image library or by uploading your own, with your logo creates an appealing look for your social media pages. In addition to allowing you to reinforce your brand on each page, it adds a refreshing element to the background picture. Connected to their social media is Tailor Brands’ weekly planner. This is a tool that allows you to plan out social media activity for the week ahead. Pre-prepared social media posts can be saved and posted along multiple channels, on an automated basis. This takes much of the hassle out of keeping a steady, engaging flow of content coming. Rather than having to build this into your daily routine, you can set time aside to tackle the task all at once. Tailor Brands provide a “brand book” as part of your branding package. This is a centralized document where a wealth of information about your brand guidelines is stored – covering all key areas of your identity. This will include information about fonts, spacing, primary and complementary colors, as well as information on how to place and re-size your logo. This is a valuable tool, as it ensures you have a go-to resource to ensure you are using a consistent brand identity across all communication channels and platforms. Introducing new staff to your brand guidelines is made simple and accessible, as well as consistent. Working with freelancers is simplified – just show them your brand book for a fast and reliable reference point for their work. These differ from the traditional analytics which you might find on a website builder, for example. Tailor Brands’ analytics do not simply cover statistics like clicks, hits to your site and individual pages, or social media engagement. They make the point that understanding the success of your brand is significantly more than this and so track metrics around its visibility and exposure – not just on social media, but on the web more generally. One of the most appealing features of Tailor Brands is the speed at which you can produce your content. It doesn’t take hours to create a logo or landing page. All you have to do is simply type your logo name and click the Design button. Leave the rest to the tool. It will generate results in about less than 30 seconds. There is a range of design-based products to choose from and which can be customized to your taste. 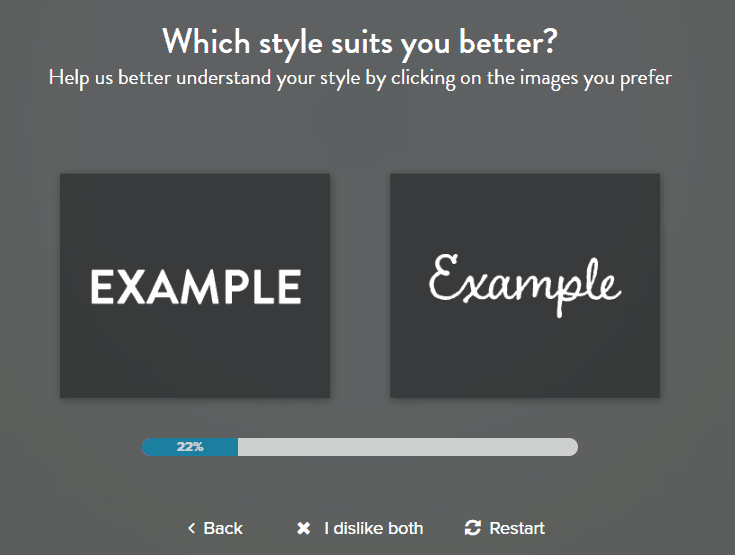 Tailor Brands uses machine-learning technology to identify your likes and dislikes and to adjust the designs according to them. When you log on to the website, Tailor Brands.com, you’ll land on the intuitive and user-friendly home page. The products page provides you an overview of all the products offered by Tailor Brands – which is an impressively extensive offering. 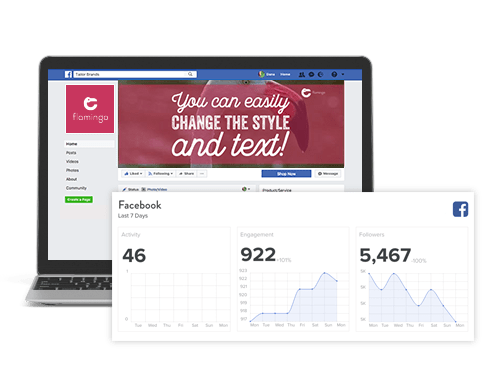 These products include a logo builder, engaging and customizable social posts for all major social media platforms, brand strategy service, brand analytics for monitoring your social media performance, and a minimal but intuitive landing page builder. You’ll also find many stationary-based branding products such as business cards, your own custom brand book, seasonal logos, and EPS files. Finally, you can also get a full business deck comprising of your branded business proposal, letterhead, and invoice. Of course, not all of these are essential for any given business, and their usefulness depends on your size and scope. Tailor Brands’ offer is particularly strong because it provides end-to-end branding solutions under one roof. You can avail yourself of one or multiple services for your business growth. A great feature of Tailor Brands is that you can dive right in via a trial subscription and see how everything works, without having to buy a subscription. You can browse all the design aspects and can work on designing your perfect logo. The process is very simple and begins with you entering the name of your brand on the homepage. Once you enter the name of your brand, you’ll be asked to enter the name of your industry. As you start typing, a list of dozens of industries will appear in the drop-down for you to choose from. You can even enter a small description of your business, which helps the machine-learning algorithm come up with a better design for your business. Once you are through this step, you’ll be asked to choose either an icon-based logo, a name-based logo, or a logo based on the initials of your brand name. You can either choose an option or skip this step to let the algorithm determine a design for you. The next steps in the process depend upon the choice, if any, that you make here. For example, if you choose an icon-based logo, you’ll be asked whether you want to use an abstract shape as your logo or choose a picture from their gallery. Similarly, if you select a name-based logo, you will be presented with multiple sets of two images each, and you’ll be asked to choose the one you like over the other. This step is repeated 5-6 times, since it helps the algorithm in better understanding your design preferences and aesthetic sense. If you skip choosing a logo type altogether, you will still be presented with multiple sets of logos to choose from, so that the algorithm can “understand” what attracts you. Once you are done with this step, the builder will get to work and in less than 30 seconds, you will have your results. You will be presented with dozens of logos – along with previews of what your branding will look like on social media, business cards, T-shirts, letterheads, mobile view, and a whole array of other products with your branding. At this stage, you can either finalize the logo or continue to customize it. You can precisely edit every aspect of the logo including color, font, spacing, etc. Please note that you can only edit the logo if you have a subscription. Trial users cannot edit the logos. Once your logo is done and you are satisfied with the result, you can proceed towards the checkout and choose a subscription plan that fits your needs, make the payment, and have your complete set of branding materials. Tailor Brands offers extensive support including a dedicated help center and a Knowledge Base featuring a huge catalog of articles and FAQs (Frequently Asked Questions). The home page of the help center is headed by a search bar, allowing you to quickly narrow down the options in your hunt for information. Below this is a large list of Frequently Asked Questions, each linking to a separate page where the question is answered. Products – Provides guidance on each of the fourteen products Tailor Brands offers, such as Brand Analytics, Business Deck, and Landing Page. General – Deals with questions regarding package information, pricing, and details about subscriptions. Using Tailor – Goes into significant depth in guiding you through various elements of Tailor Brands’ interface. This section includes ten video tutorials providing an engaging step-by-step breakdown, teaching you to how to use many of the key products, like the Business Card and Brand Book tools. Tailor Brands does not offer phone support or live chat but has a responsive and helpful email support service. When I submitted a request for email support late in the evening, I immediately received an automatic reply confirming receipt and pledging a response inside 48 hours. The response came inside 12 hours, from a named member of staff. I had wanted to find out whether I could upload an existing logo for adaptation. The staff member explained that this isn’t possible at present but that they would feedback this requirement for a potential future improvement. Overall a good support experience. Tailor Brands seems to be well aware that hefty prices are going to deter users from utilizing its products. So, keeping in mind the budget constraints of individuals and small companies, particularly startups, it has made its packages quite affordable. You can design a logo for an impressively low monthly fee if you purchase an annual subscription and pay upfront. Alternatively, for a higher fee pay month to month. Either of the packages is reasonable, and affordable for individuals and companies alike – although you are definitely well-incentivized to purchase the annual package. Tailor Brands is a comprehensive branding solution that you can rely on, so it’s best to invest in the annual subscription as it not only saves you from having to pay each month but is also much more affordable than the monthly subscription. You get all of the above with the Dynamic Logo subscription plan. Then there’s the premium package. It is reasonably priced if you pay annually, but I would argue it is prohibitively expensive if you choose to pay month to month. Again, it is best to go for the annual subscription if you’re serious about your branding and are planning to use this site over the long term. With so many useful features, I would argue that it is well worth the modest investment. For companies, the premium plan is recommended as it’s loaded with many more features as compared to the basic plan. Tailor Brands offers a full range of branding products – not just logos. From social media to presentations to branded letterheads, you have a lot to choose from. The basic and premium plans are affordable for everyone. There’s a free trial that lets you use the logo builder so you can get a feel for their products. There are, however, a few drawbacks. There isn’t exactly a plethora of information on the home page, and while it is quite intuitive, new users can still sometimes get confused, especially if they are new to this type of website. Despite that, the range of features and power of their social media tools and centralized brand information mean once you get to grips with Tailor Brands, it is sure to have a great deal of value for users of all levels. Overall, Tailor Brands offers an array of branding solutions at very reasonable rates. It is particularly suited to startups and solo entrepreneurs, as it can save them a lot of time and can save them the often significant cost of hiring a graphic designer.